That was how Ralphie Parker’s mom reacted to her 9-year old son’s dream of owning a Red Ryder BB gun in 1940s America, as depicted in the classic movie A Christmas Story. It’s not hard to imagine how she’d feel today, when Ralphie would be hinting about and begging for an electric scooter instead of a BB gun for Christmas. Some parents understandably have concerns about letting their young kids ride electric scooters. But the truth is that kids go almost as fast on their bikes and “kick” scooters as they do on electric models, and many pre-teens have been riding motorized go-karts for decades. Razors and other scooter models are a lot safer and environmentally-friendly than go-karts, and in reality they’re no more dangerous than the bikes and scooters that nearly every child already owns – as long as they wear the proper helmets and padding, naturally. It’s important to discuss one qualification, however. Electric scooters have a varied range of top speeds and features and some of the great models on the market just aren’t suitable for children under the age of ten, primarily because they go too darn fast. For example, UberScoot makes a terrific electric scooter that tops out at around 25 miles per hour. There may be some parents who’d hand one of those babies over to their 9-year old, but we certainly wouldn’t advise it. The Razor E300 is also a great scooter with a lower maximum speed, but smaller kids won’t be able to reach the brake. You’ll see both of those machines on our list of the top 5 best electric scooters for kids under 15, but we won’t review them here or recommend them for younger children. One final word: we usually try to provide a number of different manufacturers or brands in our “top 5” lists, but we’ve made an exception here. That’s because Razor is so dominant in the market and makes such great scooters, we didn’t want to search for lesser competitors just for the sake of variety. You’ll see several Razors on our list.​ Read our Best Electric Scooter Buying Guide here. Enough of the preliminaries. Here are the top 5 best electric scooters for kids under 10 – and don’t worry, they won’t shoot their eye out. It didn’t take long to get to a Razor, did it? That’s because we love the quality of their scooters, and the E100 is well-built, safe and tremendous fun for kids as young as 6 or 7 although Razor’s recommended minimum age for this model is 8 years old. The E100 is designed as an “entry level” scooter, and it includes a feature you won’t find on most electric models but is perfect for younger kids just starting out: the motor won’t engage until the scooter reaches a speed of three miles per hour. While kids who are experienced riders might find that annoying, it’s just right for those who are getting the hang of their first scooter because it lets them get used to the feel of scooting without worrying about the throttle and brake. Once this Razor is running it can only reach a top speed of 10 miles per hour, letting kids slowly become acclimated to the mechanics of riding a powered scooter. The deck (the flat area where you stand, sometimes called the plank) is full-sized and will even accommodate those who want to keep both feet together on the scooter. The single-speed twist-grip throttle and the front brake control are each mounted on the handlebars (the brake is underneath the throttle) so they’re easy for younger kids to reach and master, although the brake isn’t quite as strong as we’d like. Like all Razors, the E100 is solid and well-built. The fork and frame are steel, the large pneumatic front tire (there’s a smaller urethane rear wheel) is designed to handle the normal bumps of riding on the sidewalk or other paved areas, and the chain-driven motor is quiet and powerful enough to carry a rider weighing as much as 120 pounds. There’s a pair of two 12-volt sealed rechargeable batteries allowing a riding time of about 40 minutes, perhaps a little more. You do have to charge the batteries for more than twelve hours before first use, though. If your child is closer to age ten than age five and is already experienced at riding a scooter, you might want to take a step up and start him or her off by moving up one notch on the Razor ladder to the E200. The chances are good that any kid who starts with an E100 will want the upgrade after a little while anyway, so we’d recommend starting at the higher level if you’re not quite sure which to purchase. The basics of this model are very similar to the one we’ve just discussed: steel construction, full-sized deck, dual 12-volt sealed batteries, quiet operation and around 40 minutes of continued use between charges. The differences, though, are what gives this scooter better performance. There are 8” pneumatic tires front and back, and the back tire improves the smoothness of the ride and allows for slightly higher speeds – up to 12 miles per hour. The E200 is more “controllable” than on the E100 because the twist-grip throttle is variable speed (and doesn’t require a kick-start at 3 mph like the E100), and the hand-operated rear brake is much better than the front brake on the E100. It’s also built to accommodate larger children (and smaller adults!) with a 154-pound weight limit. Razor recommends the E200 for ages 13 and up – but we’ve found they “over-rate” age levels significantly, most likely for legal reasons. We think this is the perfect model for those in the 9-10 year old range, and most parents who’ve purchased this model agree; after all, it’s only 2 mph faster but is more stable with better brakes. 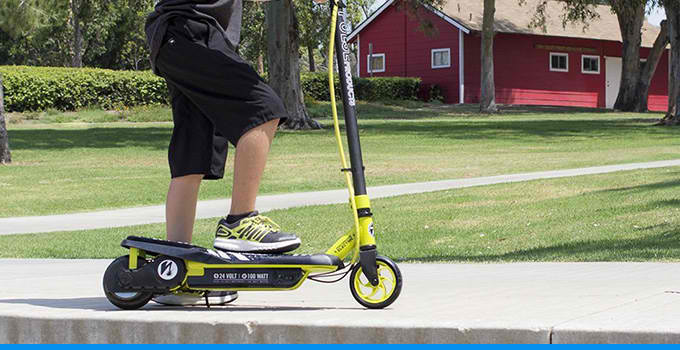 There are plenty of 8-year olds who would also be able to handle this electric scooter, but if you have any doubt in your mind because of your child’s size, maturity, coordination or experience level, we’d suggest starting with the E100 and then upgrading when your kid is ready. He or she will probably be ready pretty quickly. The E200 costs about $170 and is available in a variety of colors. You can tell that we’re partial to Razors – as are the millions of people who buy the company’s scooters every year. But those who would like to start their young one with a less-expensive product that’s age-suitable, yet still strong enough to deal with the “abuse” an eight-year old can hand out, should take a close look at the GRT-11. This scooter has a single 12-volt battery and a top speed of 8 miles per hour so it’s slower than the E100, and it’s a kick-start model which won’t use electric power until it’s already traveling a few miles per hour. That may set your mind more at ease when handing it over to your younger child. The Pulse is manufactured with a chain-drive system, a large deck, and strong tubular steel frame, stem and handlebars for durability. Where this model suffers somewhat is that the scooter has front and back polyurethane wheels instead of pneumatic tires, so the pavement grip and stability aren’t quite up to that of the Razor models. There’s a foot-activated rear brake which simply turns off the motor, and the throttle is thumb-activated and mounted on the handlebars so it’s easier for novices to figure out. The battery charge on the GRT-11 lasts about 50 minutes, and while you shouldn’t expect it to climb steep hills or stay upright on tough off-road terrain it’s a very good “first electric scooter” for younger kids. It’s available in blue or red, for around $80-90. Yep, another Razor. This model is lighter than the E100 (because there’s only one 12V battery) and slightly easier for younger kids to master, so if you were a little hesitant about the whole idea of an electric scooter in the first place this might be the one to start with. Razor recommends the E90 for ages 8+, so you can definitely be comfortable putting your younger kids on board. We won’t go into the construction details of this Razor, except to say that it’s as well-made as their other products. Instead, we’ll highlight what makes this scooter simpler to ride than the ones we’ve already discussed. There’s a push-button throttle (on/off) instead a twist-grip one, and a foot-pedal brake, so there’s less for beginners to “learn” – the only thing they have to do with the handlebars is hold them. This is also a kick-start model so kids can simply ride the scooter like the ones they’re familiar with, and the motor will kick in after they’re going a few miles per hour. The whole experience is less intimidating for those climbing onto an electric scooter for the first time. This scooter has a top speed of 9 miles per hour. The features of the E90, along with its urethane wheels, won’t keep older kids satisfied for long and it’s not a bargain since it’s priced at about the same level as the E100. If it gives you extra peace of mind, though, it’s worth considering. We promised an option for your littlest kids, and here it is. Pulse makes these three-wheel scooters in a number of themes your children will love, including Disney Princess, Spiderman and Teenage Mutant Ninja Turtles – but once they get on board, they probably won’t care about the theme because they’ll be having too much fun. The Safe Starts have two wheels in front and one in the rear, with a low center of gravity and a low-torque motor so they won’t tip over and will start very slowly, reaching a top speed of just 1.75 miles per hour. A pre-teen or teen wouldn’t think this model is even moving, but for 3-5 year olds it’s an entirely new world for them to be riding a powered vehicle, and there won’t be any worries for the parents watching. This is a fun toy for the little ones, and even more “useful” if their older siblings are riding electric scooters; the pre-schoolers can have one of their very own and feel all grown-up, for just $65.